Our professor wanted to expose us to the Preservation side of architecture. 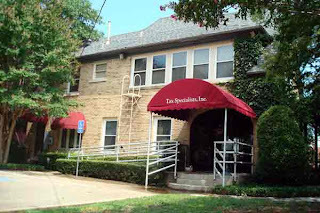 Arlington, Texas has a number of historical sites scattered about. Of course, one must keep in mind that "historic" in the DFW Metroplex means it's older than about 50 years old, once again proving Eddie Izzard correct when he makes fun of us. "We've restored this building to the way it looked over FIFTY YEARS AGO!!!" "Surely not! No one was alive back then!" Now, granted, we don't have any buildings that one can literally rent or buy that someone built before the advent of Monotheism. And one would be hard pressed to even find a building constructed before the 1900's over here. Be that as it may, we are slowly gaining an appreciation for our own history, so long as it doesn't get in the way of gigantic sports stadiums, theme parks, car dealerships, parking lots, or anyone with a large enough wad of cash to make us forget that maybe there was a reason for that quaint old place to stay there. ...Done looking? I couldn't even find a reference to the current owner. I tried contacting the Historical Society and received no answer. So far the only information I had been able to find out was from that one liner blurb on the pamplet. On a hunch, my professor gave me the name and number of a very kind woman named Geraldine who was able to give me the current owner's name (Xavier Carrillo) and the greenlight to visit the site. Meanwhile, I visited the University of Texas at Arlington Special Collections archives to see if I could find anything at all about the building. My search turned up absolutely nothing. I found one photo of the 800 block of East Abrams, but it was taken between 1910-1915, and according to the pamplet, the house was built in 1928, and the archives were closing for the evening. The next morning, I visited the site to find it was currently a Tax Specialist office. So, I headed along to the side of the office to get a better look. 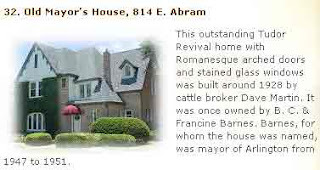 It is a beautiful house, well restored Tudor-Revival House with what appears to be Mid-Atlantic Tan brickwork and stained-glass windows. The place has a very loved, well-manicured look about it. I head to the front and find it closed. Then I realize the driveway actually leads to a parking lot in back. Perhaps that would be where I need to park and enter through the back. No such luck, it's closed and locked too. Geraldine had greenlit my taking photos of the house, but I wanted to be extra careful not to offend anyone, so I called the non-emergency line for the Arlington Police Department, and informed them of what I was doing. For any students of architecture, history, photography, etc. Whenever you have to study a site, it's always a very good idea to let the police know exactly what you are doing, why, for how long, what you are wearing, and so forth. Otherwise, at best you might merely be stopped by the police and inconvenienced for half an hour while they figure out if your story is legit. At worst, you might get shot for trespassing by a panicked owner. My conscience clear, I stepped out of the car and got as many exterior photos as I could. The front photos aside, one thing I noticed is the house is now ADA Compliant. Complete with a handicapped parking spot, a ramp. The house also now has a fire escape as a method of egress. Both would be required for a business, technically, but doing so is always difficult because one ultimately risks damage to the historic nature of the house, the look and spirit of the place can become ruined. I think in this case, they did quite a good job. The ramp access is in back, so that the front of the house is preserved, and yet it gives easy access and parking. I noticed on the side opposite the driveway was a very picturesque garden, and had to take a closer look. Wow. Makes me wish I had one of these. What looks like a roof is actually a portico with a trellis, and a thick layer of foliage along the top. 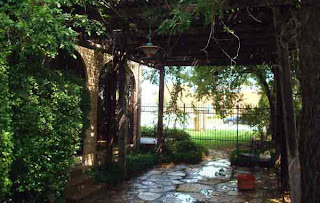 The flagstone, arches, greenery, and shade makes a great refuge from the heat and noise of the house's unfortunate surrounding context of auto shops, convenience stores, and fast food chains. I took another couple of pictures when sure enough, someone approached me to see what I was about. I explained my situation as honestly as possible and it turned out she was the property manager, had access to the interior, and would be happy to show me around the place. She even knew of a few old photos of the place and a few articles. I had struck archival gold! 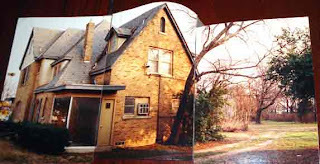 The first thing she showed me was a couple of photos of the place before it had been bought and restored by Mr. Carrillo. As you might be able to tell, the two front corners of the house had been cut out and replaced with large plate glass display windows. That's because it had been a dress shop before it had been purchased by Mr. Carrillo. It also had no central heating and air conditioning. It had no driveway, no parking lot in back, and the whole house itself, though handsome, was in a considerable state of disrepair. 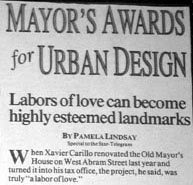 But Xavier Carrillo had seen promise in the place, and sought to restore its original beauty. He did a great job. In fact, he did so well, they gave him an award. Original slate roof was restored, though in 2006 had to be replaced with a standard composite roof due to prohibitive cost. Plate glass window on northwest corner was replaced with brick. 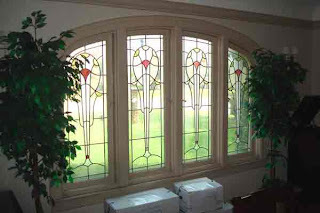 Plate glass window on southwest corner replaced by arched window to match the rest of the house’s theme. 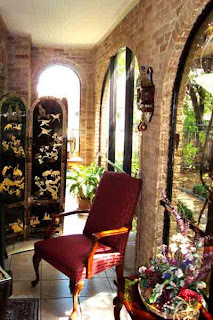 Back porch portico converted into interior space with large arched windows. Central A/C and Heating installed. 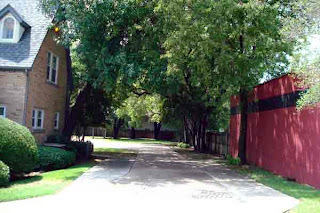 Arbor, curbs, sidewalks, and a drive for rear parking were all installed. 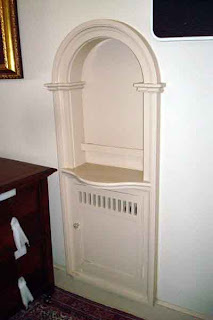 The property manager also showed me a few photos and articles of other houses restored by Mr. Carrillo, which looked great. He apparently restores historic landmarks as a personal hobby, and one at which I must say he's become quite proficient. I asked if they had any older photos or information on the house, at which point the Property Manager directed me to this painting. What you are looking at now is a painting of the house as it would have looked prior to the crude re-purposing the dress shop had inflicted on the property (~1950's). As you can see, there is a significant difference in the look of the place. 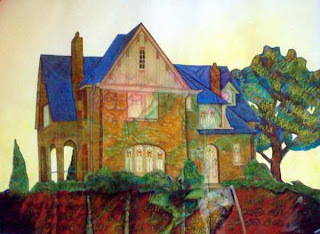 The artist is a miss Gretchen Schwab, who painted this in 1996 as a gift for Mr. Carrillo. The east (left) part of the house is shown as an open porch with an arched portico which has since been converted into internal space with arched windows and an external portico added. And, of course, no tacky plate glass display windows. 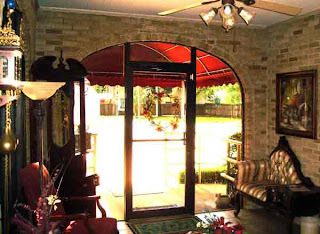 As previously mentioned, Carrillo internalized the arched portico space, converting it into a great connecting rear foyer. 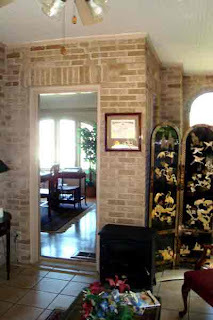 The room is beautifully decorated and the brickwork matches the rest of the house perfectly. 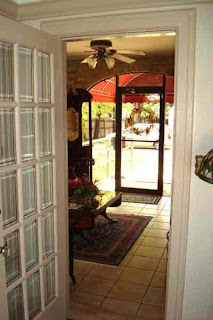 The third photo you see used to be the back door leading to the portico. 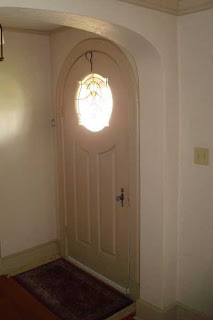 This is the other side of that door. 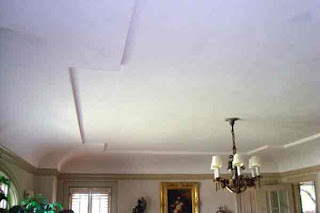 We are now in the signing room, what would at one time have been the formal dining room. It is, likewise, beautifully done. The fireplace is gas. I never did get a final answer on whether or not the actual framework of it is original or not. 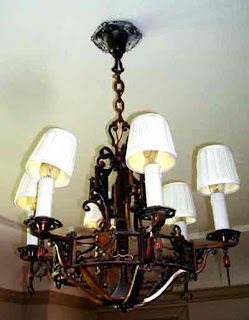 ...with the original chandelier, which I later found out was designed by the home's architect. When I asked about it, the PM told me it used to be a phone booth, and that Mr. Carrillo had decided to leave it like it was. As it turns out, this was an incredibly wise decision. 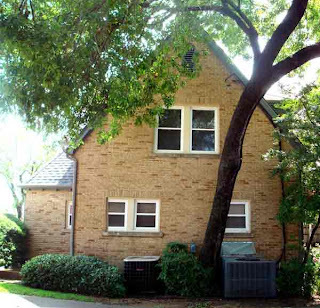 When I returned to the UTA Special Collections Archives later that day, I decided to change my tactic, and search for things relating to "The Old Mayor" rather than the house. 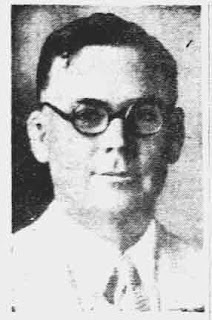 Barney C. Barnes was mayor from 1947 to 1951, and is the person the house got it's nickname from. 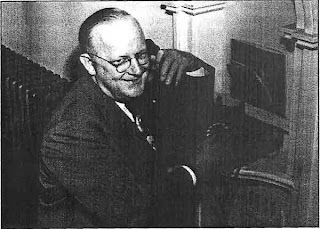 By odd coincidence, he was also instrumental in getting UTA up and running, though it wasn't called UTA at the time. Perhaps one of those photos, articles, or books somewhere would have something about the house. I should take a moment to mention that searching through Special Collections archives is a painfully slow task. In an age where high-speed wireless internet access and streaming video of nearly everything in the world is available on most modern cell phones, the archives are like a black hole of knowledge which never escapes to the digital world. Hardcopies are actually stored according to how many linear feet they take up. Checking out even one single item requires first thumbing through literal pages upon pages of finding-aids, guessing at what box might have something about what you're looking for, filling out a form, waiting for it to be processed, the box to be looked up, carted out, gloves worn to manually examine the contents one at a time. The vast, vast majority of the time you will not find what you are looking for, and will have to start the process all over again. Assuming you do find a photo, article, or anything else that you would like, you will need to fill out two additional forms, wait for them to be processed. The item you wish to have copied will need to be returned internally to a special lab where you might see your copy in about half an hour if you are lucky enough to only need a xerox of an article or post card. If you actually need a scan of a photo, it will cost you six dollars per copy and a few days wait. These areas are also typically only open during normal business hours. I don't say this to denigrate the UTA Special Collections by any means. They have their processes in place for very good reasons, and serve a vital purpose to researchers. What I wish to convey to the reader is that this type of research will not only seem alien to you if you've never done it before, but it is also not a quick process. Should you ever have a project that requires access to a Special Collections archive, expect it to take days to find even one relevent item. Recognize that phone booth? Now look closely at the phone. It's a rotary-dial phone, as opposed to a crank-switch. And why on Earth would someone have taken a photo of the mayor on the phone, at his house, while he obviously poses for the shot? I found the answer about two hours later, thumbing through the Special Collections' randomly clipped and saved articles from the Fort Worth Star Telegram. There's more to the article, but there's the important part. Or most of the important part. 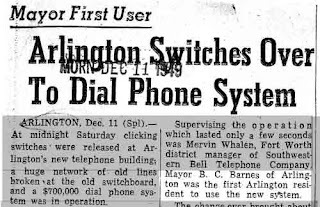 It turns out that, for at least a brief time, thanks to a deal brokered by B. C. Barnes, Arlington had the most advanced phone system on Earth, and that the very first use of that new phone system was at none other than the Mayor's house, at 814 E. Abram St. So, the age of the building aside (over 80 years old), there is reason number two for its preservation: an historically significant event, and photo documentation to prove it. Reason number three came after I'd finally gotten in contact with Mr. Carrillo, who, in addition to answering some questions about the house, had remembered that it had been built by a Mr. Hutsell. A bit more investigation finally gave me the name of the architect, Clifford D. Hutsell. 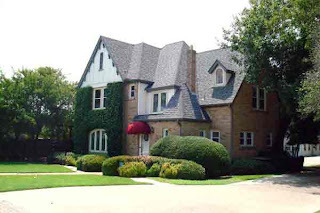 Clifford D. Hutsell was a rather prolific architect in the Dallas area. 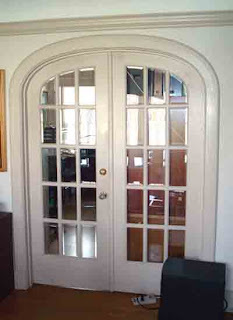 After a trip to California in 1929, he was an architect specializing in Spanish Colonial revival style. 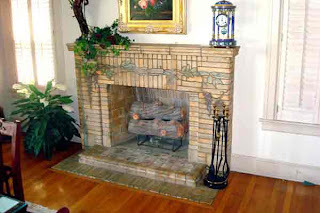 His flamboyant style typically incorporated multi-colored ceramic tile, wide-arched stained glass windows, balcony porches, exterior stairs, and several houses of his together in a row would seem to fit together like a jigsaw puzzle. 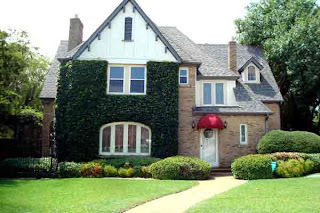 He is credited as the primary architectural influence in the Lakewood County Club District as well as Highland Park--two of the most exclusive neighborhoods in Dallas. However, before he left for California, he was not an architect, but merely a Grapevine-born city planner who had tried his hand at designing two houses. 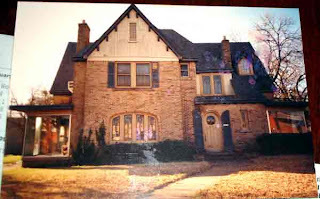 One was at 1306 W. Abram St. 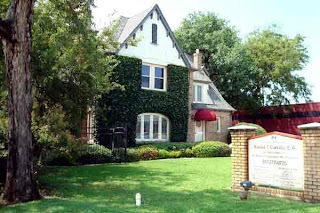 The other was at 814 E. Abram St., designed for a certain cattle baron (Dave Martin) who had inherited a patch of land. The house was later sold to W. T. Waggoner (the richest man West of the Mississippi) who built Arlington’s 1st and only Horse Racing Track. So, there are two more previously unknown reasons for its preservation. The architect was a native-born Texan (an extreme rarity for the time, as most of our architects came from "Damned Yankee States"), and was a major architectural influence on the area. The last reason is because of the figures of note who lived there, (Waggoner and Barnes). Thus, the case for preservation is made. I will be producing a CD with my powerpoint, findings, and original photos for myself, the UTA Special Collections, and Mr. Carrillo, should anyone need more information. This article was primarily about the journey. The powerpoint is far more succinct and chronological.